From today, many of the trains serving the UK’s National Rail network will be operated by different companies. 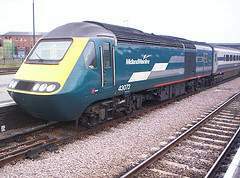 One of the changes sees Midland Mainline’s service, which connected cities such as Leicester and Sheffield with London, merged with local services on the eastern part of the network formerly operated by Central Trains. I for one was quite disappointed when it was announced earlier this year that Midland Mainline’s parent company, National Express, had lost the new franchise to that purveyor of unpunctual bus services Stagecoach. Midland Mainline was consistently voted the top train operating company in both customer satisfaction surveys and for punctuality. Their trains still retained many of the features that should define intercity rail travel. Many of the services were still operated by the 30-year-old trains that have never been surpassed in terms of top speed or passenger comfort by any diesel-powered locomotive anywhere in the world. On board, the trains were reasonably clean, there was a buffet serving hot food, and best of all, all passengers were entitled to free tea or coffee. This last gesture, which can only have cost the company a few pence per passenger, made passengers feel that little bit more special. Before you knew it, the Gothic towers of St Pancras were on the horizon, the journey having captured some of the romance of the bygone age of rail travel. With their track record (no pun intended), how could Midland Mainline lose the service to a different company? Unfortunately, we have to consider the other part of the new franchise, which was previously operated by Central Trains. Their trains were the antithesis of Midland Mainline’s. Dirty, overcrowded, noisy, and often late. If you were lucky (and the carriages weren’t packed full of standing passengers) someone might push a trolley through offering coffee and bags of crisps at inflated prices. The trains were far from pleasant to travel on. Yet Central Trains was also owned by National Express. How could a company make such a good job out of running one service, while another was so dismal? Unfortunately, this would seem to suggest that the good service on the Midland main line was at least partly an accident of circumstances – the line must be less congested, and the onboard service is simply what distinguishes any local train from an intercity express. So what do Stagecoach have in store? For a start, the free tea and coffee is going to stop. To make matters worse for regular commuters, the buffet service is being withdrawn completely, with hot food not available for standard class passengers. Instead, they will offer a trolley service. Already it sounds as if the result of the merger is that the intercity part is going to be reduced to the level of the local services. It would be nice if the ticket prices could reflect this: in the past, unless tickets were booked at least a fortnight in advance, a ticket from Leicester to London cost a small fortune. Somehow, I suspect a reduction in prices won’t be on the cards. Living up to title of best train operator would never be an easy task, but it isn’t a good start to make passengers feel less important than they used to. Everyone knows rail companies are there to make money, but they can at least try to give the impression that they value their customers. It’s a pity that, just days before the new Eurostar terminal at St Pancras opens, widely heralded as the start of a new golden age of rail travel in the UK, the trains using the other end of the station are losing the edge that made them that little bit special. Footnote: as I no longer live in Leicester, I no longer need to use the Midland main line very often. What are people’s experiences of the new East Midlands Trains service? Do you have any memories to share, good or bad, about Midland Mainline? Please leave a comment. haha, that’s why i found out the british rail way service getting worse recently, very bad. not good as before. it always delayed and it takes more time now, much slower than before, i do not like the present system. it seems changed only few weeks ago. it getting worse……. I used the midland mainline service usually from leicester to loughborough to goto bingo . And the free coffee was brilliant, it didnt cost them a fortune and you had to make it yourself, but was just nice to sit and relax to for a few minutes. I’ve always found the service on these trains to be excellent and the saftey record speeks for it self as far as I’m aware there has never been an accident involving midland mainline trains. I live in a narborough a little village outside leicester and between here and leicester it’s central trains now arriva. And oh my god what a joke there dirty smelly disscusting, staff are unfriendly and unhelpful. Since arriva cross country took over the contract it’s exactly the same with the old central trains stickers scratched off the sides. So Same Trains, Same staff, same bad service. I must have been dreaming to think when this was first announced in june that we might get virgin trains running down the birmingham to leicester route. East midlands trains buffet only for first class is not a good start and shows they don’t give a dam about ordanary people with children. How many family’s with children can afford to travel first class? Can you see gordan brown traveling on a service from leicester to nuneaton for example, If he ever did then I think he would make trains a top priority. Still what can we do ? We need to use the trains to get us to places quickly and we have to take what we are given. Next they will be stopping the free electricity for mobile’s and laptops. Ironically, as an annual season ticket holder I just got sent some vouchers for free tea or coffee and actually there’s more hot drink options than you could have under Midland Mainline. Hot chocolate for example! Nice of Stagecoach to do that. Pity that as of Dec 2009 if their plans go ahead, I may not actually be able to get on the train let alone to the buffet car, due to the overcrowding. Given the choice I’d prefer “being able to get to work at all” over “free tea and coffee”.